I have problem with Attiny817 Xplained mini board. I used this board few months ago with Atmel Studio 7.0.1645 and it works fine. Now I installed Atmel Studio 7.0.1931 and launch and connect the board to the computer but it now installed as Atmel USB Devices Atmega 32U4. 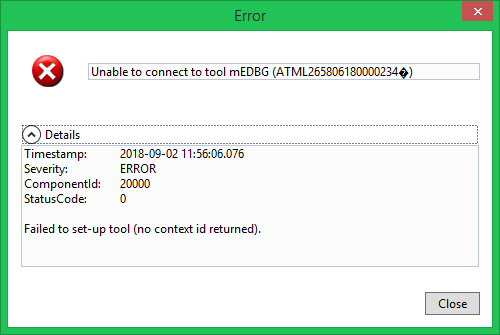 I don't have installed have mEDBG and COM port. So installed board isn't useful in Atmel Studio. Why this board now is installed as USB Device not mEDBG device. It's in firmware upgrade mode. To get it out, do a manual fw upgrade. In studio, go to tools/command prompt and issue 'atfw -t medbg -a /tools/mEDBG/medbg_fw.zip'. But, you did say that you had used it before? What did you do when it broke? The serial number of my board is ATML265806180000234 and question mark on black background. When I bought this board I used Atmel Studio 7.0.1645 with this version of Atmel Studio that board working fine. The software normally recognized the board despite the bad serial number. Later i put this board to the drawer because i played with STM32 and now I pulled it out and connect to the computer and she doesn't recognized as medbg device. I don't know what happened with her.